Pet collars and microchips are essential to help ensure that lost pets are reunited with their owners. It breaks your heart every time you see a “lost dog” or “missing cat” flyer in your neighborhood. You never think it could be your furry family member in one of those signs, but then the unthinkable happens: Your pet escapes from the backyard and he is nowhere in sight. What should you do? Stay calm and focused: Of course you’re upset, but you need to locate your pet as soon as possible and freaking out will only delay that from happening — every minute counts because the longer the time they’re gone, the further they can travel. So take a deep, cleansing breath so you can move forward to find your pet. 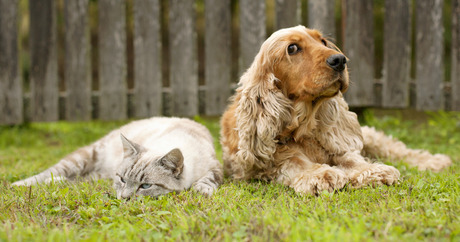 Check the neighborhood: After you’ve thoroughly checked the house and yard and concluded Fido or Fluffy is nowhere to be found, carefully check the neighborhood, letting neighbors know your pet is missing. Don’t forget a photo of your pet to show them. Make phone calls: Call around to neighbors and then to animal control, the SPCA and shelters letting them know that your pet is missing and what he or she looks like. Post flyers: If there’s still no sign of your dog or cat, make one lost pet flyer to include a color photo of your pet. The words “LOST DOG” or “MISSING CAT” should be bold at the top, then your pet’s photo and list his or her name, breed, color, weight, and any distinguishing features, provide your name and two phone numbers. Don’t be afraid to say things like, “He’s very loved!” to appeal to other’s emotions. Make dozens of copies of your flyer and post liberally around your neighborhood and around your town. Make sure to ask permission before posting flyers. Some good places to post them include: on trees or lights near stop signs or intersections; at animal shelters, animal control organizations, parks, dog parks, ball fields, veterinarian offices, grocery stores, community centers, church bulletin boards, pet stores, gas stations and schools, and anywhere at eye level where people congregate. When posting flyers near schools, the ASPCA suggests placing them at kids’ eye level as they tend to be more observant about pets. Socialize your post: After you’ve done the physical flyer posting, next make a similar digital post using the same picture and be sure to post on sites like Facebook, Twitter, Pinterest, Google+, and Instagram. The power of social media, especially local Facebook groups, can be especially effective in helping spread the word about your pet. Many pets are found and returned because someone checked Facebook to see if someone else was missing a dog and vice versa. Don’t forget about sending an email or text with a photo and info about your pet to everyone local or semi-local. Smells can help: Leaving out an article of recently worn, unwashed clothing can help your dog or cat find his or her way home because the pet could pick up and track your scent. Putting out a bowl of your pet’s food can also help with tracking the smell to come home. Likewise, the familiar scents of your cat’s litter box outside can help lure your kitty. Don’t give up: It can be emotionally and physically exhausting looking for a lost pet, but don’t stop. Sometimes it’s useful to do a rigorous search for a couple days and then take a break for a day, and return to fight the good fight for your four-legged friend. Remember: Many lost pets can be found only because of the dogged determination of the owners.